The following is excerpted from an article released July 20 by Crowley. American Maritime Officers represents all licensed officers aboard the Commitment Class ships. Crowley Maritime Corp. announced today that it has taken delivery of El Coquí, one of the world's first combination container/roll on-roll off (ConRo) ships powered by liquefied natural gas (LNG), from shipbuilder VT Halter Marine Inc. El Coquí is the first of two Commitment Class, LNG-powered ConRo ships being built for Crowley's shipping and logistics services between Jacksonville, Fla., and San Juan, Puerto Rico. 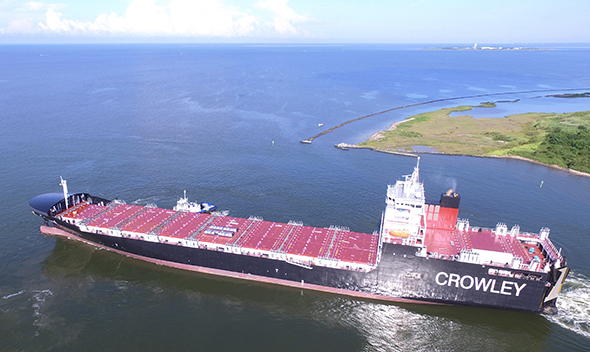 Operated by Crowley's global ship management group, El Coquí will make its maiden voyage to San Juan later this month from Jacksonville (JAXPORT), its dedicated U.S. mainland port. Construction of sister ship Taíno; is well underway at VT Halter Marine's shipyard in Pascagoula, Miss., and she is scheduled to enter service later this year. "This delivery represents another milestone in our unwavering commitment to Puerto Rico and the Jones Act," said Tom Crowley, chairman and CEO. "We have dedicated significant time, effort and more than $550 million, which includes these new ships, to transform our Puerto Rico shipping and logistics services to world-class standards. We thank the men and women at Crowley, VT Halter Marine and other partners, who have dedicated themselves to bringing this magnificent new ship to life." "The talented workforce of VT Halter Marine is to be commended for its dedication to delivering El Coquí to Crowley," said Rob Mullins, chief executive officer of VT Halter Marine. "We are proud to be a part of Crowley's long-standing legacy in transportation services, and recognize the important role these vessels will play in enhancing supply chain services for Puerto Rico shippers." Construction of El Coquí, which is named for the popular indigenous frog on the island, has been managed in the shipyard by Crowley's solutions group, which includes naval architects and engineers from company subsidiary Jensen Maritime. "This is a thrilling time for the U.S. shipbuilding industry, as evolutions in LNG technology are providing a historic opportunity for American yards and the supporting industrial base to design, build and outfit some of the most technically-advanced and environmentally-friendly vessels that are the envy of the world," said Matthew Paxton, president, Shipbuilders Council of America. "American skill and ingenuity, as well as critical laws like the Jones Act, serve as the backbone of our industry and embolden innovation and investment in domestic shipbuilding. El Coquí is a shining example of the work being done each day in our industry, and we are proud to support her, her crew and those who built her, as El Coquí embarks on her first journey from Jacksonville to San Juan."